Thousands of rehearsal hours and hundreds of sunflowers, that’s what! Well, at least it does to bring about a Revolution of Kindness. All our research, hard work and commitment will come to fruition on Saturday 29 September when our (not so) Quiet Revolution of Kindness finally premieres at this year’s Derby Festé. It seems like yesterday that we were recruiting for physical theatre performers to join our company and now 6 months on, show day is upon us. Circus performers Rosy Roberts and Matt Wood have been working with the company and our production team to create a phenomenal show that will stay with you, not just from the sheer quality of performance, but also the underlying theme of kindness that we hope will inspire our audience members to be more considerate of others and to connect with their neighbourhoods and communities – because kindness can change the world! Rosy originally studied medicine before realising that operating theatres have neither spotlights (well at least, not aimed at her face) nor adoring crowds! So she decided to swap the stethoscope for the stage and thank goodness for us she did! She trained at Circomedia in Bristol and has performed in numerous productions for the likes of the English National Opera and Mimbre (impressive stuff!). Likewise (and as equally impressive) after graduating from the National Centre for Circus Arts in London, Matt has gone on to perform in many different roles in the industry, performing in the West End, dancing for TUI, being a stunt man in music videos and being a fire spinner! We’re so delighted that they have joined the team to not only share their talents and skills with the company, but to also learn from our actors too, who are: Anna, Amy, Bethany, Bharat, Izzy, Laura, Rachel and Rob. I love the Hubbub vision and ethos. Kindness lies at the core of the company, and from this bedrock of kindness they create theatre that is inclusive, generous and playful. I wanted to be a (not so) quiet revolutionary too! To work with Hubbub is to be totally immersed in a spirit of play, warmth, generosity, and arrant silliness. I’m looking forward to marching with my co-revolutionaries! Also, I can’t wait to be a part of the Hubbub ensemble and observe the magic that happens in the spaces in between. 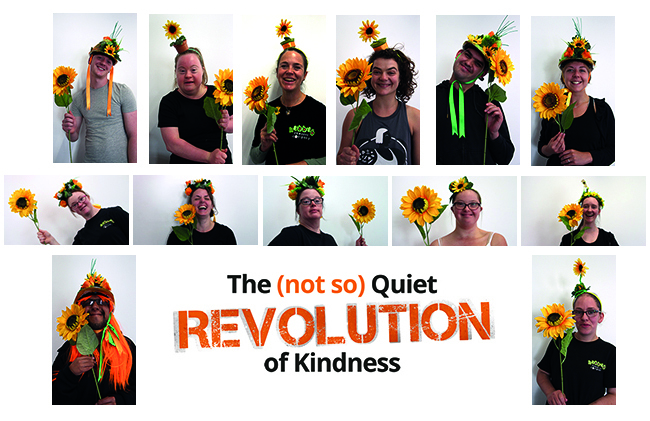 So with rehearsals nearly being over and hundreds of sunflowers making their way into shop fronts up and down Derby’s Iron Gate, there’s not much more to say (type), other than, make sure you join us this Saturday and help us spread the Revolution of Kindness! Performances last approximately 30 minutes and will begin at 1.30pm, 3.30pm and 5.00pm at Derby Cathedral, we’ll then march to the Market Place and perform on the famous Waterfall Stage.